Elite athletes — including Olympic medalists — will descend on the island for the Bermuda National Athletics Association on Friday May 11th, with athletes from the BVI, USA, Nigeria, Bahamas, Barbados, US Virgin Islands, Trinidad & Tobago, Puerto Rico, Canada, Grenada, Cayman, Turks & Caicos, Dominica and Great Britain all set to compete. These international athletes will be joined by some of Bermuda’s best, with Tre Houston, Tyrone Smith, Bruce DeGrilla, Jessica Lewis and Sakari Famous all scheduled to compete, offering locals the rare opportunity to see some of our own elite track and field athletes in action. 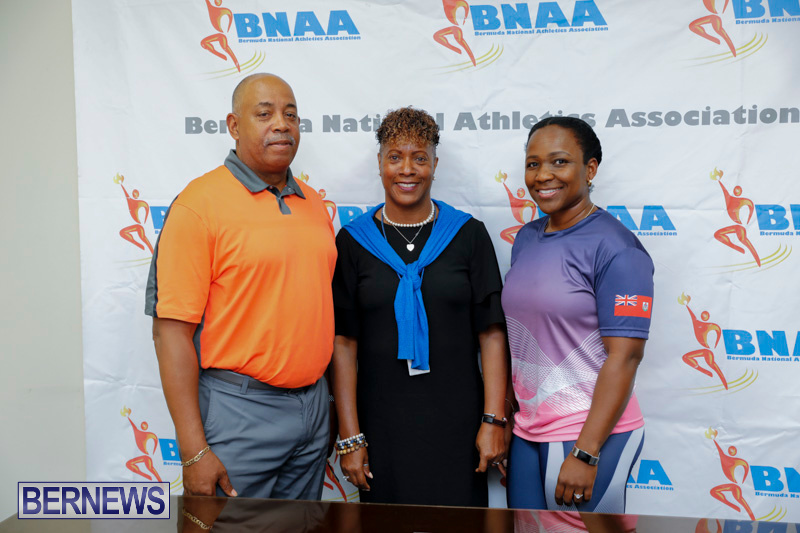 Speaking at a press conference this afternoon, Bermuda National Athletics Association [BNAA] President Donna Raynor said, “The Bermuda National Athletics Association is pleased to announce the 3rd Bermuda Invitational Permit Meet. We are very excited this year with the athletes who will be coming to our shores to compete in this event. “The event will be held Friday May 11th at 6:00pm at the National Sports Centre with 2 ½ hours of exciting track & field with the Hamilton Town Crier opening the event at 5:50pm. “Now that we have witnessed the fantastic performance by Flora Duffy and watching the international athletes compete in Bermuda, Bermuda now has a chance to see even more international athletes at our event. We have Commonwealth and Olympic medalists competing. We will have around 70 athletes competing at this event. “We would have liked to have more of our Bermudian athletes compete but due to the timing of the event, which is not entirely under our control as we have to fit in with the NACAC circuit, several of our University students are unable to participate due to school commitments. At the end of the day one of our main goals is to assist our athletes in receiving athletic scholarships. “Bermuda’s two Olympians Tre Houston will be competing in the 100m & 200m and Tyrone Smith in the Long Jump. One of our up and coming long jumpers Bruce DeGrilla will also compete in that event. “Our Paralympian Jessica Lewis will be competing in the 100m & 200m Para events. Bermuda’s multiple Carifta medalist Sakari Famous will be competing in the High Jump. We decided three years ago to host this meet in Bermuda so that our elite Bermuda athletes have a meet at home to participate in and showcase their talents to our Bermuda public. “The events that will be held for the men will be 100m, 200m, 400m, 800m, 110m Hurdles, Long Jump, Shot Put and the 200m & 400m Para events. The events that will be held for the women will be 100m, 200m, 400m, 100m Hurdles, High Jump and 100m & 200m Para events. “Now let’s get down to unveiling the athletes who will be coming to participate in this event. “Leo will be competing in the 800m event and we have several athletes who have run under 1:46 so that should be an exciting event. “As stated earlier we will be having for the first time the men’s shot put. This event will feature Josh Freeman from the USA, Dillon Simon from Dominica, Chad Wright from Jamaica, and Garrett Appler from the USA. “We have a stacked field in the long jump field featuring, as stated earlier Tyrone Smith, against jumpers having leaped over 8m. “We have several repeat athletes who have enjoyed competing in Bermuda and continue to return and are bringing family members with them to see our diamond in the Atlantic ocean. “We have athletes coming in from various parts of the world, British Virgin Islands USA, Nigeria, Bahamas, Barbados, US Virgin Islands, Trinidad & Tobago, Puerto Rico, Canada, Grenada, Cayman, Turks & Caicos, Dominica and Great Britain. “We will be featuring our Primary, Middle and High School male and female relays. They will be the schools who made it to the finals from the Schools Relay Classic event which is being held this Friday May 4th. “Tickets can be purchased at PTix.bm and the ptix location. The BNAA will also be selling tickets at the mall Saturday May 5th from 10:00am – 2:00pm. Prices are $15.00 uncovered seating, $30 General Admission and $55 VIP which includes food and parking. Extra parking will be at the arboretum.